With over 10,000 homeless people in Denver, the down and out are often seen on the street as panhandlers. Behind each face is an identity, constructed from unique stories that share details in common with your story. Sixty percent of homeless people have families and children. And in Denver, the most common reason for homelessness is job loss. 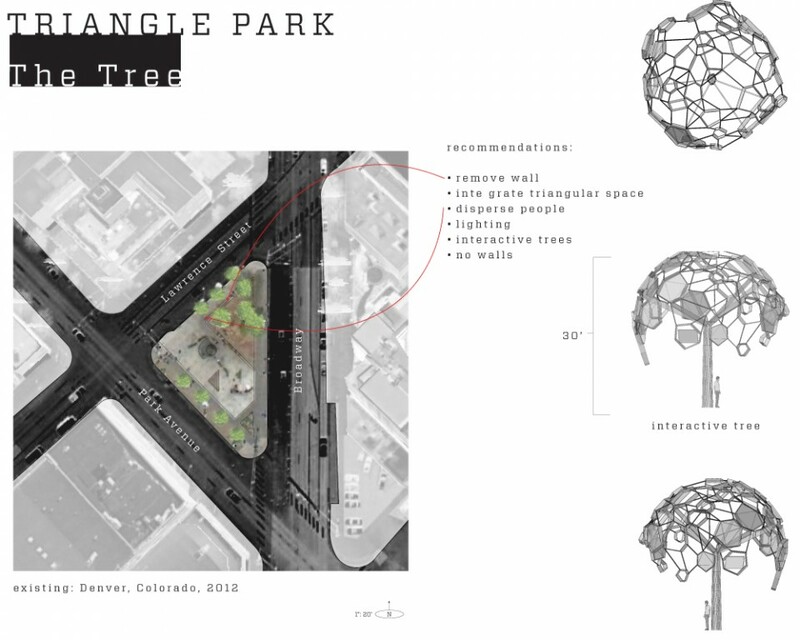 Triangle Park has been described as “ground zero” for the homeless population in Denver. Triangle Park is an island space, formed by the edges of public commuter corridors. It is a relational environment that finds connections to the shelter across the street; it is a resting spot for people, waiting for their only meal of the day; it is a place for people to sit, hoping to get into the shelter at night. Until the problem of homelessness can be significantly reduced in Denver, a shift in public perception must occur; the “separation of us from them” must be addressed. We propose a spatial design that humanizes the problem. Situated within the park, a large-scale display system would rise above the space, providing protection from the Denver sun. 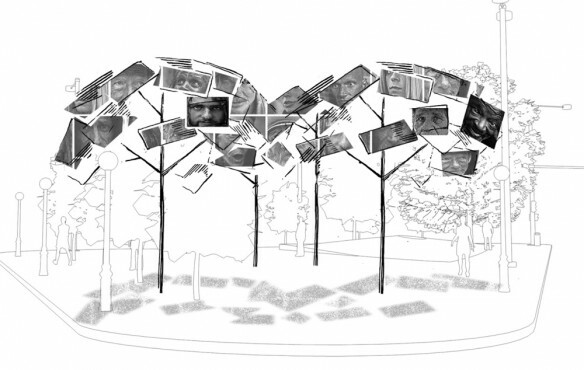 Housed in an interactive sculpture, streaming images that are both homeless and non-homeless faces. By blending and weaving the faces together, people driving through the area would not know if they are looking at a homeless face or a non-homeless face. The large-scale faces would be impossible to ignore, and will raise questions regarding identity and who are the homeless. 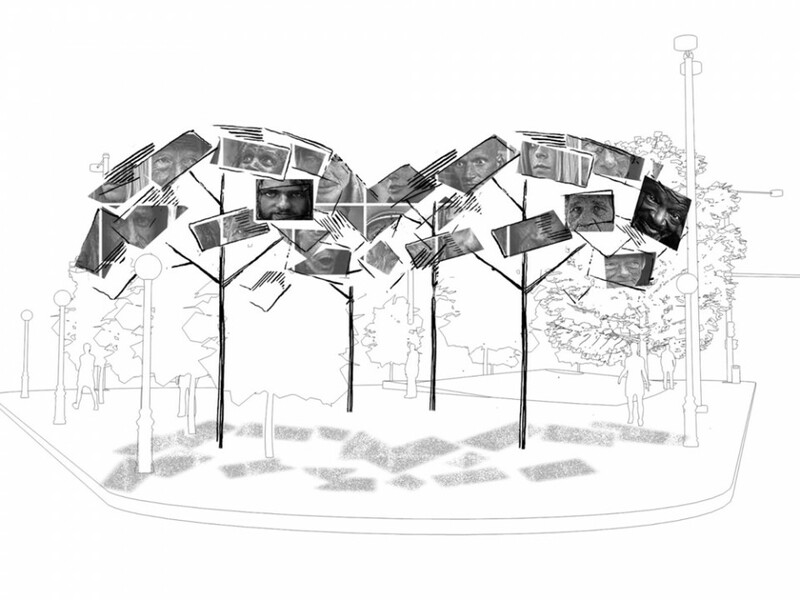 To obtain the images of faces, we propose to install ‘photo booth’ stations in the community centers surrounding the park. These would include Redline, shelters, the Greyhound bus station and other appropriate venues. Open to the public, these stations will capture an image of a face, storing it online for streaming to the sculpture. Optionally, the subjects could record their story for an online companion to the sculpture. The display system would be an LED electronic display, of the kind usually reserved for sporting arenas, affluent theater districts, and for commercial advertising. We propose to use this medium to raise awareness of the homeless, while at the same time providing a spectacular display of light and color into an otherwise dross-like neglected space. The residents would feel prideful as their images are displayed for all to see, and the city will gain a dynamic and highly visible gateway to downtown. Commuters driving through the area will be reminded of the human faces that make up our city. By co-locating photo booths in both the ‘high-art’ space of Redline, and the shelters we are deliberately mixing the human faces that will populate this sculpture. The technology will be designed in consultation with lighting and structural engineers to be durable, low-energy consuming LED display systems. Curtains of LED lights will act as pixels, creating a transparent curtain of light that will display images of faces streamed from a central internet/server collection point.The “photo booth” collection points will be kiosks that capture an image after pressing a button.This will insure that only willing participants will have their image displayed. Optionally, the participant could attach a story to their image. The images will be transferred to a central web portal and processed for display by the sculpture. There will be some simple software-checking using face-recognition algorithms to insure that only faces are queued for display. Images would be chosen at random from the queue and displayed. There will be an initial design phase where details of the concept are designed and approved. Construction concepts and initial cost estimates will be in concert with JunoWorks, a local metal working firm, and Martin/Martin, a full service engineering firm. The cost, materials and construction details will be worked out during a construction drawing phase. Detailed plans will be developed and a visualization of the project will be created to understand the sculpture in scale to the space. Cost estimates will be provided. Bryan Leister and Rebecca Heavner will provide the guiding vision, drawings and visualization renderings needed for the design and ultimate implementation of this interactive sculpture. Collaboration with supporting team members would include metal fabricators of JunoWorks and the structural engineers Martin and Martin who will provide engineering assistance to realize their vision. Bryan Leister incorporates interactive technology and programming in his artwork and installations exploring perceptions of organic and manufactured nature. Inspired by 19th century artist, Ernst Haeckel, Leister finds order in random forms and uses technology to trick the eye in the tradition of trompe l’oeill and illusionism. His past collaborations with choreographers and performers has produced work that has been performed at the Kennedy Center Millenium Stage, The Woolly Mammoth Theater and the Corcoran Museum’s Concert series. Rebecca Heavner has recently worked in the landscape architecture firm, Michael Vergason Landscape Architects, Ltd., Alexandria, Virginia. She defines her role in landscape architecture as a creative collaborative practice, a vision defined by her artful process that draws upon the expertise of 25 years as an illustrator. Her thesis addresses the critical and reflective use of media in landscape architecture. Her interest lies in the documentation and representations of the systems that describe the unique qualities evident in the urban landscape. In 2007 she collaborated choreographer Jane Franklin to produce a dance performance In Hiding,” a Kennedy Center production that utilized her Flash animations in concert with composer Gina Biver. JunoWorks is a leading provider of metal working services, including design, project management, construction and installation. JunoWorks is currently working on several architectural and art projects in Denver, Houston, Austin, and Reno. JunoWorks recently constructed and installed a work by Donald Lipski, called ‘Tent’, at the Indianapolis Motor Speedway. Founded, owned and operated by sculptor Mike Mancarella, JunoWorks is a custom metal fabrication studio specializing in art and architectural metal works. Experts in crafting steel, our team excels in projects requiring stainless steel, aluminum, copper or bronze. Located in central Denver, JunoWorks has successfully completed projects nationally and internationally. John Grant was the Director of Denver’s Public Art Program for nine years overseeing 147 permanent Public Art installations. Since then he has acted as Project Manager for artists on major Public Art sculpture installations around the country. Martin/Martin, Inc. is a full-service civil and structural engineering and surveying firm of 180 employees, operating from Colorado since the 1940s. Over 87% of their work comes from repeat clients. Receiving nine Gold Hard Hat Awards in 2010, Martin/Martin has an informed staff with a commitment to quality that keeps clients returning time after time. Their services are provided to municipalities, public and private redevelopment entities, architects, home builders, state and federal agencies, land developers and special districts in Colorado, across the United States and in other countries. Projects include: Evie Garrett Dennis Campus at Green Valley Ranch, Fort Carson BCT-H Brigade and Battalion Headquarters, Fort Carson, Colorado, Auraria Science Building, Denver, Colorado. With engineers licensed in 38 states & DC; Alberta, Manitoba & Ontario, Canada, project experience is varied in over 46 states and overseas.